Exolon is a Run and gun shooter released for the ZX Spectrum and other systems in 1987. 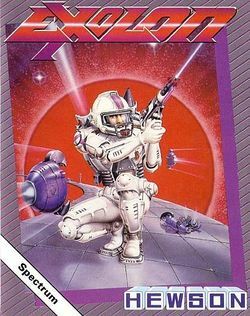 In Exolon, the defense system for a planet malfunctioned, attacking friendly ships, with the player being deployed to attack the weak point of the defenses. As with other similar games around that time, the player need to shoot enemies and avoid being contacted with enemies or their projectiles. This page was last edited on 26 June 2011, at 04:33.